Face recognition has been one of the most remarkable and important research fields in the past two decades. The reasons come from the necessity of automatic recognitions and surveillance systems and the interest in human visual system on face recognition etc. It captures the image; identify individuals by applying facial analytics or comparing the same with the existing database. Previously the facial recognition systems were used in security purposes but now they are also used in other applications as well such as use in the offices for attendance tracking and monitoring. 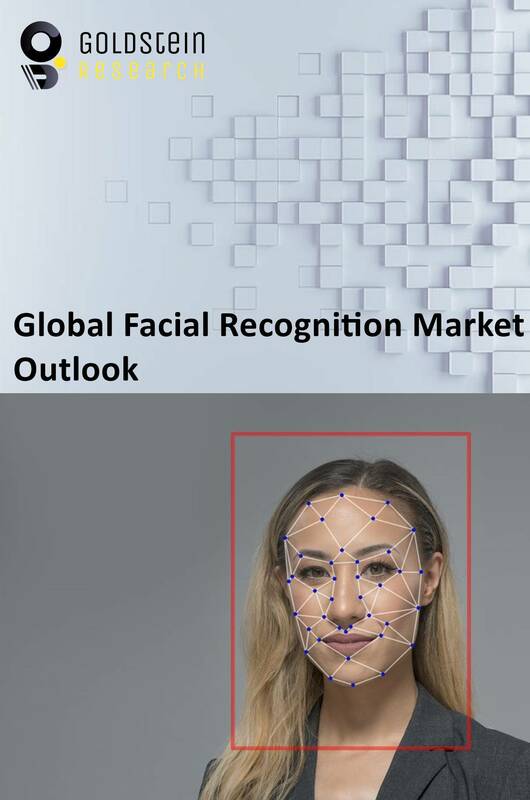 Goldstein Research analyst forecast the facial recognition market size is set to reach USD 9.75 billion by 2024, at a CAGR of 14.0% over the forecast years. With the increasing criminal activities, security measures in the ATMs and increase in installation of facial recognition systems at airport and shopping malls is driving the global facial recognition market. The report covers the present ground scenario and the future growth prospects of the facial recognition market for 2016-2024 along with the huge investment in the R&D by the vendors due to increasing ferocious activities around the globe. We calculated the market size and revenue share on the basis of revenue generated from facial recognition market with the increase in product extensions. On the basis of end user, government sector generated the largest market share of 44.0% in 2016 owing to high demand in security surveillance, government offices and defense. In US major cities such as Chicago, New York etc. have extensive facial recognition systems so as to track people using video surveillance and to detect thefts and fraud. In addition, this technology is also implemented by the government in countries such as India, Pakistan etc. for individual identification. Furthermore, enterprise sector is growing steadily as many offices are using facial recognition for attendance tracking and monitoring. Global facial recognition market outlook report 2016-2024, has been prepared based on an in-depth market analysis from industry experts. The report covers the competitive landscape and current position of major players in the global facial recognition market. The report also includes porter’s five force model, SWOT analysis, company profiling, business strategies of market players and their business models. Global Facial Recognition Market Report also recognizes value chain analysis to understand the cost differentiation to provide competitive advantage to the existing and new entry players. Our global Facial Recognition market research comprises of the following companies as the key players: Aware, NEC Corporation, Ayonix Corp., Cognitec Systems, KeyLemon, nViso and Herta Security. Other high-flying vendors in the market are: Techno Brain, Neurotechnology, Daon, Animetrics, 3M Company, IDEMIA, and Gemalto. According to the report, major driving factor for facial recognition market is the increasing demand for security and surveillance systems in civil and government sectors. Many facial recognition systems are introduced in households for security purposes. With the increase in number of cases from 500 to 700 of data breach has increase the demand for advanced surveillance systems, which is increasing the global facial recognition market. Further, the report states the major challenge is the high implementation cost, high maintenance cost and low accuracy is affecting the global face recognition market. Although, the players are improving the accuracy with the use of different algorithms which will reduce the high implementation cost as well. Based on geography, North America dominated the global facial recognition market with the market share of 45.5% in 2016 with the increase in the criminal investigation and for the security purposes in the houses. On the other hand, Asia Pacific is expected to grow at a CAGR of 14.6%. Countries such as India, China, Japan, Australia and Singapore are using facial recognition technology in various fields such as defense, law enforcement, physical security, and retail. What is the revenue of facial recognition in 2015-16 and what would be the expected demand over the forecast period?